A preview of 10 of the hottest new launches and concepts at the Auto Expo 2012 edition. If you are a petrolhead, you surely know that the Indian auto industry comes alive every alternate year when the Auto Expo comes to town. Manufacturers wait for this opportunity to show off their new wares at Pragati Maidan, in New Delhi, and consumers are more than happy to play audience. Not surprising then that 2012 is beginning with the same cheer. The Auto Expo is the cynosure of all car manufacturers' eyes. Be it concepts - which will never be marketed - to production cars - which everyone can buy - the fair promises everything. So sit back as we take you through a preview of 10 of the hottest new launches and concepts at the 2012 edition. 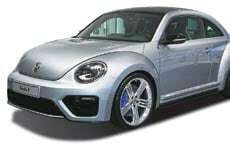 Appeal: The Beetle was rejuvenated some time back and now the same car has been given the 'R' treatment. This makes it much more sporty not just in looks but also in performance. However, the one to be launched in India will be the standard car.